Discussing #NFDF2014 Norwich Restaurant Week in #NorwichLanes with @RafflesFood – over delicious Rapido lunch. This year is the 10th anniversary of the Norfolk Food and Drink Festival and the organisers are determined to make it the biggest and best yet. The festival is already the largest in the UK – with volunteers running numerous events, both large and small, across the county from 30 August to 12 October. However, this year we want to do more in Norwich – which is where the festival started. Among the many events being planned is the ever popular Battle of the Bangers, which last year attracted over 5,000 sausage lovers to taste the finest our local butchers have to offer. There will also be the City Farm and a Norfolk Producers market – all outside The Forum on Saturday 6 September. This will coincide with the final day of the reinvigorated Norwich Restaurant Week, which will run from 1-7 September and is being supported by Norwich BID and Norwich Lanes. The current chair of the Norwich Lanes committee is Jayne Raffles. She and her husband Nigel have been running restaurants in Norwich for 24 years – and currently have three in the Norwich Lanes district: St Benedict’s, The Library and Pinocchio’s. I had the pleasure of meeting them both for a Rapido lunch in Pinocchio’s to discuss their plans for making the most of Norwich Restaurant Week. I have to admit to having a real soft-spot for Pinocchio’s. It’s the place we tend to go for family celebrations, including the day we moved back to Norfolk, the night (four years later) when we finally moved out of a rented house into our own home, as well as various birthdays and anniversaries. It reminds me of the family-run trattoria in Bologna we tried when we visited Italy – with good, honest food, prepared fresh every day. The ciabatta we had for lunch certainly tasted delicious, packed with chicken, mushrooms and pesto. As did the arancini, deep fried rice balls with chorizo and smoked mozzarella, and pin-wheels (rounds of bread) filled with a rich lamb ragu. Sadly I was driving, so had to pass on a glass of Moretti (my favourite Italian beer if you must know) but the homemade Sicilian lemonade was so deliciously refreshing I was slightly surprised the Famous Five didn’t arrive on their bikes with Timmy the dog just to knock back a jug or two. This passion is reflected in Jane’s championing of the Norwich Lanes organisation, which promotes independent businesses in the city centre. As chair, Jane works closely with the Norwich Business Improvement District (Norwich BID) team, which has raised £3m to improve the look and feel of the city centre. Both organisations support special events in the city centre throughout the year. The Lanes committee is organising four big events this year. The first was the successful revival of Jack Valentine in spring, with Norwich BID’s help. Next up, on 6 July, is the hugely popular Summer Fayre – which just gets bigger and better every year. Then in October the Lanes will support the 5th Sound & Vision festival at Norwich Arts Centre. And finally, the organisers are planning a late night open-shop/open-restaurant event for December (more on this nearer the time). Meanwhile, Norwich BID will be laying on street entertainment every Thursday throughout the summer. The Head Out, Not Home campaign (which runs 12 June to 28 August) aims to encourage people to stay in the city after work and make the most of the long (and, we hope, sunny) summer evenings. To keep up to date with what’s on each week, follow #NorwichEvenings on twitter or download the BID’s ‘Discover Norwich’ app. Finally, as if all those events were not enough, Jayne and Nigel are planning an extra special event in November to celebrate the 100th anniversary of the reopening of The (Norwich Subscription) Library building in 1914 (after a devastating fire in 1898). This will run from 1-7 November and will involve The Bookhive, Jarrold, the Writers Centre, the UEA’s Writers’ Circle and the Blue Badge Guides. There will be children’s events on the Saturday (including pop-up bookstalls and storytelling) and authors’ evenings (including book signings) during the week. Now that seems like a wonderful example of feeding the body and the mind – of which I suspect Epicurus would have strongly approved. It certainly works for me. Thank you Jayne and Nigel for an excellent lunch too. If you are interested in taking part in Norwich Restaurant Week, please post your details below and the organisers will get in touch with you. #NFDF2014 Champions’ dinner – thank you @GroveCharlie and @TheGroveCromer for hosting. Now I know, in my recent blog about lunch at the Maids Head, I said being a Norfolk Food and Drink Festival champion would rarely involve fine dining. However, dinner at The Grove in Cromer last Thursday evening was just one of those rare exceptions. After all, when you are invited by Richard Graveling, who is one of the proprietors, to join fellow #NFDF2014 champions Charlie Hodson and William Gribbon for a celebratory meal and the Head Chef is none other than Charlie, how can you refuse? Particularly when you know the menu will feature the freshest seasonal produce, cooked to perfection. Thanks to Charlie’s acclaimed talents, which he honed in AA Rosette and Michelin Starred restaurants working with chefs such as Gordon Ramsay, The Grove recently won two AA rosettes. 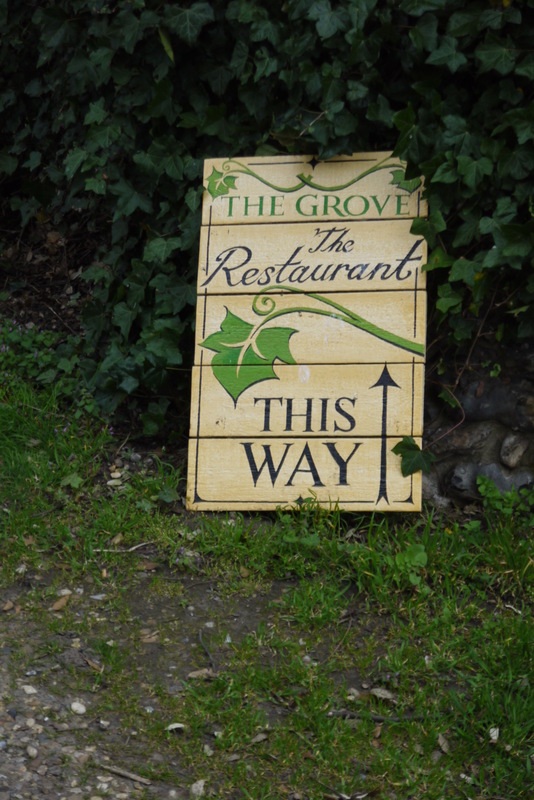 And when you’ve eaten at The Grove, it’s not hard to understand why. The setting is lovely, the food is delicious, the service immaculate – and the company on the evening was, obviously, charming. I made a point of arriving a couple of hours early because Charlie had kindly offered to give me a guided tour of the 3.5 acre grounds and a small section of the sea front at Cromer. The Grove is set back from the cliffs behind a lovely wood – so the garden is beautifully sheltered from that ‘refreshing’ north easterly breeze that sometimes blows in off the North Sea. However, it is still only five minute’s walk through the wood and down to the MCS recommended sand and shingle beach – which makes it a perfect place to stay if you want a seaside holiday. The house, which is largely Georgian in style (and was once owned by members of the Gurney family who helped found Barclays Bank), is beautiful. As are the self catering cottages (in a converted barn) and the new oak-framed Orchard Rooms – which look traditional with their wood cladding but have a refreshingly modern feel inside, including super-king sized beds with crisp white linen. 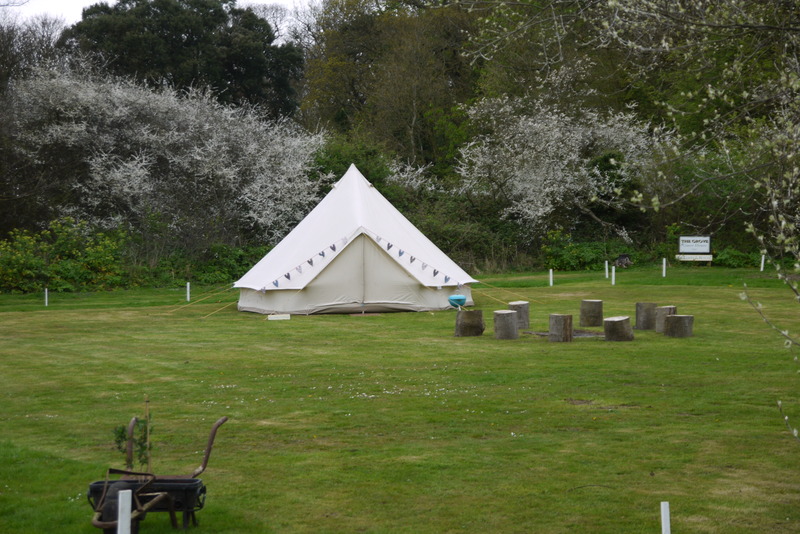 For those of you looking for a bit more adventure, there are also a couple of large bell tents comfortably kitted out for a perfect ‘glamping’ holiday by Magical Camping. 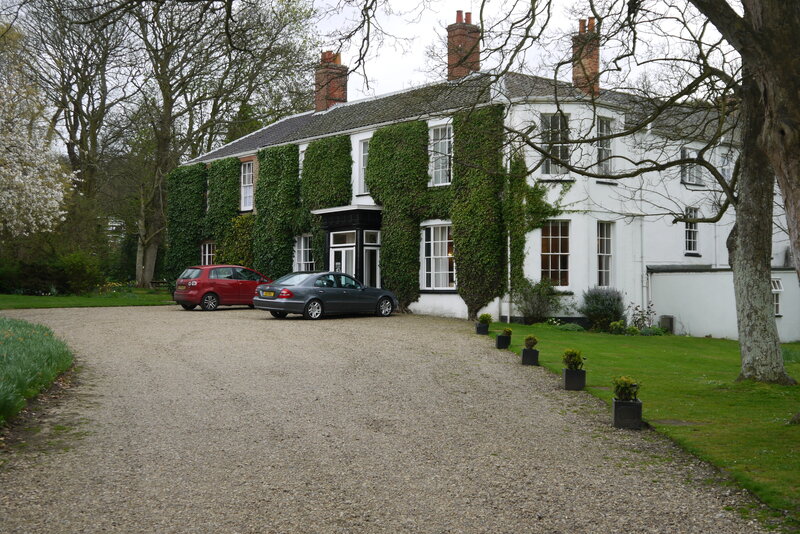 The Graveling family, who have owned The Grove since 1936 (Richard and his siblings, Chris, Elizabeth, Hannah and Ruth, are the third generation to run it) have clearly taken great care of the original property while investing to ensure they can offer all the modern conveniences you could want, including an indoor swimming pool. 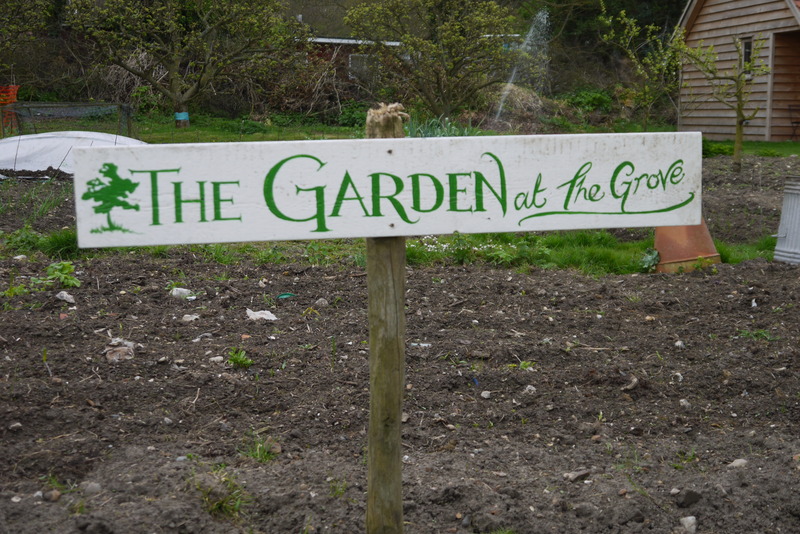 Although not self-sufficient in food, they have a sizeable plot which produces a large proportion of the fresh fruit and vegetables served in the restaurant, particularly in the summer months. I hadn’t been to Cromer for quite a few years, so had forgotten quite how delightful it is. Admittedly there are parts that have seen better days but it still retains an air of Georgian/Edwardian elegance, with fine buildings and a beautiful pier (which has been repaired since suffering extensive damage in the storms of December 2013). If you haven’t visited Cromer recently, it’s well worth a trip – there’s even a convenient train service from Norwich. In May, you can look forward to the deliciously themed Crab and Lobster Festival. There’s a Carnival in August, a literary and art festival in October/November, and a spectacular fireworks display on the pier at New Year. And of course, there are bracing coastal walks and decent surfing for most of the year (for those hardy enough for such pursuits) as well as numerous grand houses and other places of interest to visit in North Norfolk. Charlie is not only great fun to be with (his conversation as we walked round Cromer was peppered with amusing anecdotes and interesting facts) but also a master in the kitchen. We started the meal with pan-fried Norfolk Quail served on a meltingly delicious slice of slow cooked Fakenham pork belly with braised local red cabbage and Grove-grown apples. I’d never tried quail before but I certainly will again, given the chance; it has a lovely flavour somewhere between good chicken and pheasant. Our main course was line-caught Sea Bass from the Norfolk coast (any fresher and it would have been leaping off the plate), served on a bed of wild spinach (picked from the grounds) baby turnips, Dauphinoise potatoes, and – for a real treat – Norfolk asparagus wrapped in Charlie’s special home-smoked ham. Then came the pudding – and Oh boy what a delight: white and dark chocolate (providing a lovely hint of bitterness to balance the sweet) brioche pudding with Norfolk double cream. Naturally, there were some delicious wines to accompany the meal – but as I was driving I could only have a few sips of the prosecco and rosé – sadly (for me) both tasted excellent. Next time I might have to glamp. Thank you Charlie, Richard and the other guests for a perfect evening. #Norwich please vote for @NorwichHEART’s #SHAPING24 cultural education programme in @europanostra Awards. Please RT. The following is based (almost verbatim) on a press release from @NorwichHeart – it’s fairly self-explanatory – please read, vote and RT because it will help encourage people to #VisitNorwich and so support jobs and businesses in our vitally important tourism sector. Norwich HEART’s #SHAPING24 project has just won a prestigious European Award, and we would love you to help us win the Public Choice Award too. The SHAPING 24 cultural heritage tourism initiative recently won a prestigious EU prize for its work in education and awareness-raising. The pioneering project links the iconic ‘Norwich 12’ buildings with 12 heritage sites in Ghent, Belgium, and was led by the Norwich Heritage Economic and Regeneration Trust (HEART) in conjunction with Ghent City Council. The European Commission and Europa Nostra have already named SHAPING 24 as a winner of the 2014 European Union Prize for Cultural Heritage / Europa Nostra Awards. The project was selected from 160 nominated projects across 30 countries, and was a winner in the Education, Training and Awareness-Raising category. Now @NorwichHeart needs your help to win another important prize. At the awards ceremony on 5 May in Vienna, six of the earlier winners will be named as Grand Prix laureates, receiving €10,000 each, and one will be chosen in an online poll conducted by Europa Nostra to receive the Public Choice Award. So please support your fine city – Norwich – and vote for the SHAPING 24 project at http://vote.europanostra.org before 20th April. This successful project has made a positive contribution to economic development, regeneration, education and learning, community engagement, and promotion and access in Norwich and Ghent, with initiatives such as the Culture Matters international cultural heritage conference, smartphone apps, games, publications, educational projects and public art installations. You can find out more here: www.shaping24.eu. Remember – please vote and share on twitter, G+, facebook and any other social media platforms you use – because it will help support your local community.